Visual Arts Alberta Association (common name from 1996 – 2012: VAAA; common name from September 2012: Visual Arts Alberta – CARFAC; CARFAC Alberta: common name from September 29th, 2018) is a non-profit organization for visual artists, and the Affiliate for the National Arts Service Organization CARFAC in the province of Alberta. CARFAC Alberta has a Board of Directors, an Executive Director working 110 hours/month and three part-time staff each working 80 hours/month or less. CARFAC Alberta operates as one of eight provincial arts service organization (PASO) and a branch for CARFAC (Canadian Artists’ Representation/Le Front des artistes canadiens), Canada’s national voice for visual artists – an organization of artists working for artists. In 1996, the Alberta Government began funding PASOs to represent and advocate for the art sectors. As the Alberta visual arts sector did not have a suitable provincial organization, Visual Arts Alberta Association was created. really Visual Arts Alberta Association formed in 1996 to operate as a PASO for the Visual Arts Sector. As a new PASO, Visual Arts Alberta Association formed as the umbrella organization for four small visual arts, and crafts-based non-profit organizations: the Alberta Society of Artists (ASA), the Alberta Potters Association (APA), the Handweavers, Spinners and Dyers of Alberta (HWSDA) and the Alberta Community Art Clubs Association (ACACA). The ASA left the umbrella organization Visual Arts Alberta Association within two years and pursued their independence. As a new organization, the umbrella organization Visual Arts Alberta Association (called VAAA) floundered and made little impact within the Alberta Visual Arts community for the first 10 years with three groups ACACA, HWSDA and the APA having members on the Board of the organization VAAA. As a provincial organization formed to serve Alberta’s visual artists, there was little progress made due to the differing needs of the founding groups. In 2007, VAAA began meeting with CARFAC and by 2009, a formal MOU (Memorandum of Understanding) was in place where VAAA would offer CARFAC memberships for Alberta Artists in addition to their VAAA memberships. In 2012, VAAA urged the three smaller arts organizations to become independent entities. 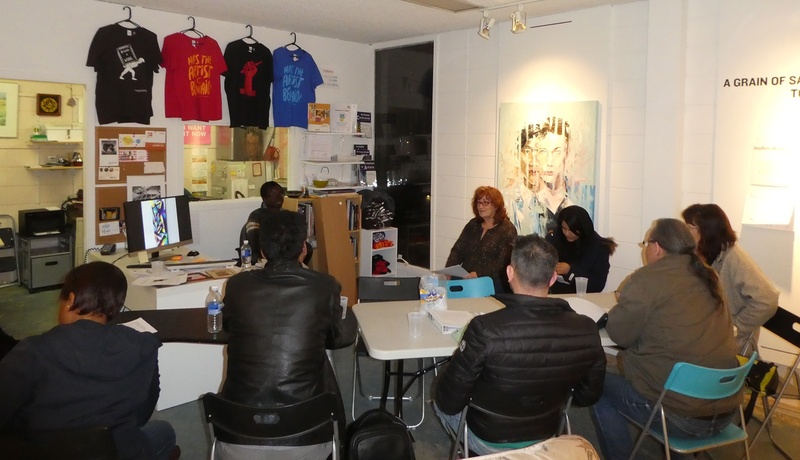 In 2012, VAAA became Visual Arts Alberta – CARFAC, the affiliate for CARFAC in Alberta. The formal ties to CARFAC, gave Visual Arts Alberta Association recognition within the Alberta Visual Arts community. Visual Arts Alberta – CARFAC continued to be the information hub that programmed educational events and exhibitions. By becoming a CARFAC affiliate, we added new dimensions to our PASO by being able to offer Alberta artists tools and resources to become more professional as visual artists and increased our role as advocates for all Visual Artists in Alberta (professional and emerging). The goal of CARFAC Alberta is to work with all Alberta artists and to give them the tools to become more professional in their practice.